It was pretty clear from the pages of Fire Touched that Mercy’s little The Doctor to the Sycorax speech was a big deal. But I don’t think any of us really had a clue just how far-reaching the potential ramifications were until it’s spelled out for us by a few different characters here. Well, okay, that’s probably not true — a lot of people who read these books probably thought about it, but I didn’t — and I think that Mercy and her acquaintances do a better job of spelling things out than I could, so I’ll let them. But many in the supernatural communities aren’t happy that she did it and are looking for ways to insulate themselves from it, as well has looking for ways to take advantage of it for their benefit. One such person is Bonarata — one of the oldest, and most feared vampires in the world — he has ties to the Tri-Cities vampires, as well. He’s the one who’s responsible for Marisila, Stefan and Wulfe leaving Europe and ending up in the Tri-Cities. He’s also a legend in Werewolf circles — many years ago, he killed an Alpha and turned his mate into a blood-slave. After the death of Chastel, Bonarata is the closest thing the non-Fae have to a Super-Villain (pretty sure any of the Grey Lords that wanted to could wipe the floor with him). So shortly after Fire Touched, Bonarata arranges for Mercy to be kidnapped. Now, while Briggs’ vampires aren’t the political wheels-within-wheels schemers that Faith Hunter’s are, they’re still crafty and wily — so all his reasons for doing so aren’t immediately discernible (and probably not totally discernible by the end of the book — but we get closer). Mercy is Mercy, however, and it doesn’t take too long before she escapes from Bonarata and finds herself running throughout Europe to escape from his henchmen. She finds herself in Prague (this detail feels like a spoiler, but it’s on the dust jacket, so . . . ) where her best bet for an ally is one of the few Alphas in the wold with a grudge against Bran Cornick. In addition to this she finds herself in the middle of a couple of vampire nests competing for control of Prague, and there’s a whole bunch of ghosts (and other things that go bump in the night) that are taking advantage of the presence of someone who can see them. Meanwhile, Adam, Marisila, Stefan, Honey and a couple of others are on the way to Bonarata’s home to negotiate for Mercy’s release. Whoops. These chapters are told in Mercy’s voice from Adam’s point-of-view, as if she’s relating what he told her happened, which is a nice touch. It also suggests that she survives this mess — not-at-all-a-spoiler: the first person narrator lives. It’s here that we learn a lot more about Honey, Marisila and Stefan — we also learn about Adam’s Doctor Who fandom. It’s nice seeing things from Adam’s POV for a change. Mostly the book consists of Adam and Mercy doing all they can to survive long enough to see each other again — which is sweet. We’ve seen them work together plenty of times in this series — we’ve also seen them apart for brief periods — this is the longest (that I can recall) that they’ve been separated, and the furthest apart they’ve been. They’re both independent by nature (however that nature is shaped into something else for the needs of the Pack), so they can adapt to this, but their primary goal is to get back together. Which I’m sure made many, many fans cheer and melt. 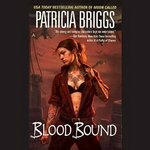 Will someone drawn in by the cover art, or wanting to see what the fuss over this Briggs-person enjoy the book? Yeah, I think so — but not as much as the established fan. This book works as well as it does because of the world, not just the story. We’ve been in Mercy’s world for 10 books now — for most of us you can add the short stories and Charles & Anna novels, too. We know it what it means for Honey to make that trip. We know what it means for people to exploit Mercy (or try to) to get to Bran or Adam. We know the pain that the loss of pack-link or mate-bond creates. 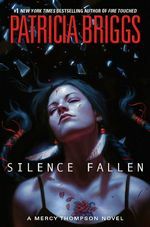 This would be a lousy book 4, but with the cumulative weight of this series, Silence Fallen us a strong book 10. It was a fun book — exciting, amusing, and fascinating to see how packs and nests work outside of the US. Most of all it was a good story, taking several competent and powerful characters out of their usual setting and circumstances, and throwing them into a milieu they’re not familiar with to watch them sink or swim. Excellent read for fans of the series — which isn’t a surprise to any, but just something I think I have to say. Now begins the wait for #11. Unabridged Audiobook, 9 hrs., 14 min. Unabridged Audiobook, 10 hrs., 2 min. Unabridged Audiobook, 9 hrs., 11 min. I’ve only posted about a couple of the books in this series, since I read most of the series before starting this blog, it feels strange not to have old posts to go back and steal from. How do I do this concisely, now? I mean this should be one of the longest posts I’ve written, if I was going to do it right. But I’m not going to do it right, I’m going to do it quick. Simply: Mercy Thompson is a skinwalker of sorts, who was raised by a pack of werewolves (a pack led by the Alpha of North America, it should be noted), who has an English degree and works as a VW mechanic. 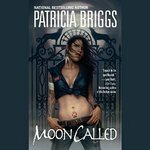 When we meet her in Moon Called, she’s living near the Alpha of the Tri-Cities of Oregon, is friends with a vampire, knows a couple of the Fae who live on the (Fae) reservation nearby. Almost no one knows about her ability to shift into a coyote (other than these supernatural folks), and she has no intention of changing that. However, she finds herself in the middle of a few goings-on in the supernatural community and becomes a prominent player in the area. In Moon Called Mercy discovers a group experimenting on werewolves — even creating some for the sole purpose of being guinea pigs. In Blood Bound, Mercy is called upon by the local vampires to pay a debt by helping them track and destroy a rogue über-vampire/serial killer. Then in Iron Kissed Mercy begins helping local Fae investigate a series of murders on the reservation, using her special abilities — in the end, she has to dance around Fae politics while trying to prove that a dear friend wasn’t behind the killings. Throughout this, she has a love life, some friends, helps the local pack with some internal issues, and finds herself in mortal danger frequently. All while maintaining her shop, sense of humor, and independence. I love these characters — all of them, I can’t think of a single one of them I wouldn’t want to spend more time with. Mercy has an attitude, perspective and humor that I enjoy, and good taste in friends/acquaintances, too. Briggs’ approach to werewolves, vampires, etc. 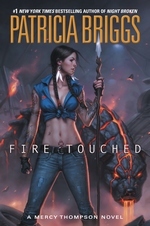 is fantastic and I frequently judge other UF writers by how they match up to Briggs’ approach. There is a richness to Briggs’ writing and to the world she’s created that’s truly impressive. It takes me less than a chapter to feel absolutely at home in the books (this happened when I first tried Moon Called and has happened with every successive volume — not just in my going through them again on audio). What blew me away going through these books is how much of this series (and the spin-off series, Alpha and Omega) is established in Moon Called — she’s what, 14 books or so in and 98% of those books can be traced to this first one. Whether that’s because she’s good at going back and picking up details to flesh out or because she plotted things out so well, it really doesn’t matter — the material was there and she’s using it well. The world she established is so well-formed that she can keep playing in it without having to invent new things, change the rules she established, or anything else. I can’t think of another UF universe that was so well-built from book one. King gives a really strong performance here — her characters are spot-on, the narrative stays engaging. Really, a bang up job, with one big flaw: she can’t pronounce local geographic names. Granted, most people who don’t live in Washington/Idaho/Montana(ish) aren’t going to notice, but man, it’s hard to listen to. If I have to hear her butcher “Coeur d’Alene” one more time . . . On the other hand, there’s this scene in Iron Kissed between Adam (local Alpha) and Ben (British werewolf who joined the pack because he had to leave England under suspicious circumstances) where Ben has to explain to Adam the psychological trauma Mercy’s suffered and how she’s reacting. When I first read the book, I was in shock a. because of the traumatic scene (really well written) and b. Ben’s more than capable and empathetic understanding/explanation. This time through, King’s performance just stunned me — it was so good. She nailed the whole thing and almost had me in tears in my cubicle. I loved the books, I think the audiobooks are among the best I’ve heard — the only reason that I haven’t gone further in this series of audiobooks is that the library system here doesn’t have #4 (they do have the rest of the series, oddly enough), and I haven’t justified the expense for myself yet. For old fans of the books, or people looking for something new to listen to — these are well worth your time. Great material presented in a pretty compelling way. If Chapter 1 doesn’t include the funniest scene that Briggs has ever written, I’ll eat my hat. Naturally, after cracking me up, I figured she’d be taking us to a pretty dark place. And while there was a good deal of darkness — and potential for big, dark happenings down the road (but I’ve thought that before, like with Fair Game) — it didn’t get as bad as I feared. There’s a scene fairly early on here that reminded me of the big ” …it is defended!” speech from Doctor Who‘s “The Christmas Invasion” — the moment that the new Doctor defined himself. Mercy does something a lot like that not realizing just how far her message will go (thanks to the Internet, smartphones, and 25-hour news cycles), and just how much trouble she’s created for Adam and the rest of their pack — as well as Bran and pretty much every werewolf in the U.S.
Part of the immediate fallout of this moment is that a human child who has been abducted by the Fae at some point that no one (including him) remembers comes to Mercy for help. He doesn’t quite fit in to this world any more, but he doesn’t want to be with the Fae, either. With a big emphasis on the latter. So, with she gives him sanctuary of a sort — at least temporarily. This brings attacks, threats, and destruction — with more to come if she doesn’t hand the boy over. You can imagine how that goes over with everyone’s favorite shape-shifting mechanic. There’s a lot more going on, but the fate of the boy is the centerpiece. There’s a major loss in this novel that moved me more than I could’ve expected. On the one hand, I think it’ll be good for the long-term health of the series. But man, it’s going to be strange opening the next Mercy book without seeing ____. I’ve seen some people disappointed with this book, but I’m not sure why. There was plenty of action — but it wasn’t as epic (for lack of a better word) as Night Broken or River Marked, maybe that’s it. You’ve got some really solid scenes — in the comedic and the action veins, Mercy makes a strange new friend, plenty of Fae politics, internal pack politics and Mercy as David Tennant. Not the best in the series (but they can’t all be), but a very satisfying installment in a really good series. That’s more than I can ask for. Again, Mercy as David Tennant. Need I say more? Yay! Mercy’s back! She’s back and she’s facing off with her most potentially destructive foe . . . Adam’s ex. Oh, sure, there’s some sort of Gray Lord threatening her, a supernatural super-baddie that Mercy and her pals have never heard of, and an escaped felon who has powers a lot like Mercy . But the big danger comes from Christy. This wasn’t a “big” novel in any real sense — seeds were planted/characters were introduced tha will be important, and I wouldn’t want to say that nothing significant happens. But, no epochal shifts, no game changers here — just straightforward case of bad guy comes to town, and Mercy et al. stop it. And along the way the final confrontation with the bad guy, we get to spend sometime with the Tri-Cities pack, as well as see some of the fallout from the last couple of books in this or the Alpha-Omega series. And that’s fine. Not every book needs to be an even, some just need to have a fun story, and maybe even move the chess pieces around a bit. Initially, the villain of the piece looks fairly disappointing, just some stalker jerk making life difficult of Christy. But it soon becomes clear that there’s more to this guy, and it doesn’t take long to see that he’s one bad customer — creepy, dangerous, and powerful in a way I don’t think I’ve seen before. All in all, a worthy competitor for Mercy and the pack. As always, the interplay between Mercy and the various members of the pack — or just between the pack without regard to Mercy — is fascinating. At once familial, yet competitive, not necessarily all that affectionate, yet more loyal than a troop of Marines. The more the Jesse/Mercy relationship develops, the more I like to see it — particularly here, where much of the book can be seen as mother v. step-mother, watching Jesse maturely navigating those treacherous waters was quite satisfying. My main (only?) quibble with the book was the way that Adam was depicted. He was continually utterly clueless about the way that Christy’s actions would/did affect Mercy. A lot of that, to be fair to the guy, can be attributed to how much he’s moved on from Christy and how devoted he is to Mercy — he doesn’t even see his ex as a potential threat. But, 1. Adam’s smarter than that and 2. given how territorial werewolves are in Briggs’ universe (and as seen in this book), it’s almost impossible to believe that he wouldn’t pick up on the territorial incursions Christy’s making. Not the best thing that Briggs has written in this series, but not the worst. It had a good story, it was good to spend time with these characters, and I enjoyed the introduction of the new forces at play. A fun way to spend a few hours. Just about everything you could ask for.